In this Chapter, we look at the subprocess of demonstrating EHBs to potential customers and users. In Section 2.1, we outline the binders or data produced during the subprocess. In Section 2.2, we outline the roles in the subprocess. In Section 2.3, we outline the steps of the subprocess. In Section 2.4, we outline the files of the subprocess. In Sections 2.5 thru 2.101, we examine many of these steps in more detail. In Section 2.112, we outline some sample Demonstrations. The subprocesses described in Chapters 2 - 7 strongly interact and iterate with one another. We outline here the key web items or binders that result from the Demonstrating EHBs subprocess. These will be described in more detail further in the chapter. Summary*, which provides the potential customers and users with an summary of EHBs. See Figure 2.1 (b). What Are EHBs? *, which provides the potential customers and users with an overview of what are EHBs. See Figure 2.1 (c). Other Applications, which outlines some of the different applications of EHBs. See Figure 2.1 (d). Objectives, which provides the overall EHBs objectives. See Figure 2.1 (e). Experiences, which highlights experiences others have had with EHBs . See Figure 2.1 (f). In The Press, which highlights articles published by others about EHBs. See Figure 2.1 (g). Architecture, which highlights the EHBs system, security, and participation architectures. See Figure 2.1 (h). Process Libraries*, which demonstrates what a Process Library is and illustrates it using a customer specific example. See Figure 2.1 (i). Requirements Capture Tools (RCTs)*, which demonstrates what a Requirements Capture Tool is and illustrates it using a customer specific example. See Figure 2.1 (j). Assembly Line Processes, which points out the Assembly Line nature of EHBs. See Figure 2.1 (k). Benefits, which point out the Benefits of EHBs. See Figure 2.1 (l). White Paper, which provides the potential customer with a general overview of what are EHBs. See Figure 2.1 (m). Book, which provides an on-line version of this book- "Electronic Handbooks (EHBs) [Where Shakespeare Meets Freud]". See Figure 2.1 (n). The items in the above list with an asterisk (*), indicate components of Demonstration Tools that can be tailored to the organizations being demonstrated. The items without an asterisk are common across all Demonstration Tools. The scope of this Chapter is to show how to develop the asterisked items. 1. Browse around the How Can I Apply EHBs To My Organization's Processes? link on the EHBs home page http://ehbs.org/. Figure 2.1 (a). NASA SBIR Demonstration Tool. Figure 2.1 (b) . NASA SBIR Summary. Figure 2.1 (c) . What Are EHBs? Figure 2.1 (d) . Other Applications. Figure 2.1 (e) . Objectives. Figure 2.1 (f) . Experiences. Figure 2.1 (g) . In The Press. Figure 2.1 (h) . Architecture. Figure 2.1 (i). Process Libraries. Figure 2.1 (j). Requirements Capture Tools. Figure 2.1 (k) . Assembly Line Processes. Figure 2.1 (l) . Benefits. Figure 2.1 (m) . White Paper. We look at some of the types of roles in the Demonstrating EHBs subprocess. Demonstrating EHBs Lead. This is the chief player who manages the Demonstrating EHB Subprocesses . Demonstrator. This is the key player of this process who peforms most of the steps above in Demonstrating EHBs. During this subprocess, the Demonstator reads the Suggestions forms to make changes to the Demonstration Tool and its components. Developer. This is the player who helps develop the Demonstration Tool and its components. We outline here, the Demonstrating EHBs subprocess. The key steps form the major part of the rest of this chapter. We look at some of the types of files used in the Demonstrating EHBs subprocess. See Figure 2.2. These represent the files for the NASA SBIR Demonstration Tool. Notice that there is a subdirectory corresponding to each of the pieces of the Demonstration Tool. Figure 2.2 (a). NASA SBIR Process Library (PL) files. Figure 2.2. (b) NASA SBIR Demonstration Tool (DT) Files. We discuss here how to create an initial Demonstration Tool. The rest of the chapter is devoted to updating the content of the tool . Problem. Create an initial NASA SBIR Demonstration Tool. 1. Create Initial Local Process Library Files. 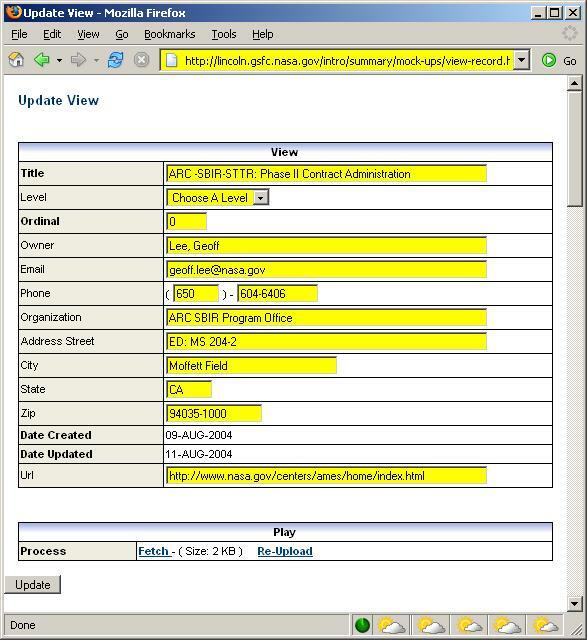 Create a subdirectory on your local computer, called SBIR, on your local computer and under it three subdirectories- Demonstration Tool, Requirements Capture Tools, and Improvement Tools. See Figure 2.2 (a). 2. Create An Initial Local Demonstration Tool. Copy a sample Demonstration Tool zip file from Appendix A1 and unzip it into the local Demonstration Tool subdirectory. See Figure 2.2 (b) Browse the local SBIR Demonstration Tool in a web browser. 3. Create Initial Server Process Library Files. Create a subdirectory, called SBIR, on your server computer and under it under it three subdirectories- Demonstration Tool, Requirements Capture Tools, and Improvement Tools. 4. Create An Initial Server Demonstration Tool. Copy a sample Demonstration Tool zip file from Appendix A1 and unzip it into the server Demonstration Tool subdirectory. Browse the server SBIR Demonstration Tool in a web browser. 1. Follow the above steps to create a new NASA SBIR Demonstration Tool. 2. Follow the above steps to create a new Demonstration Tool for your organization. We discuss here how to update the Process Matrix and Community files in the Demonstration Tool. Problem. Build Process Matrix and Community files in the NASA SBIR Demonstration Tool..
1. Edit Local Process Matrix File. Edit the local Process Matrix File in the NASA SBIR Demonstration Tool. See Figure 2.3 (a) Browse the local Process Matrix File in a web browser. 2. Copy Local Process Matrix File To Server . Copy the local Process Matrix File to the server NASA SBIR Demonstration Tool. Browse the server Process Matrix File in a web browser. 3. Edit Local Process Community File. Edit the local Community File in the NASA SBIR Demonstration Tool. See Figure 2.3 (b) Browse the local Community File in a web browser. 4. Copy Local Process Community File To Server. Copy the local Community File to the server NASA SBIR Demonstration Tool. Browse the server Community File in a web browser. 1. Follow the above steps to create new NASA SBIR Process Matrix and Community files. 2. Follow the above steps to create new Process Matrix and Community files for your organization. Figure 2.3 (a). NASA SBIR Process Matrix File. Figure 2.3 (b). NASA SBIR Organizations File. Problem. Build Examples in the NASA SBIR Demonstration Tool. 1. Edit Local Example Files. Edit the local files in the example subdirectory. Browse the local example in a web browser. 2. Copy Local Example Files To Server . Copy the local files to the server subdirectory. Browse the server example in a web browser. 1. Follow the above steps to build Examples in the NASA SBIR Demonstration Tool. 2. Follow the above steps to build Examples in your organizations's Demonstration Tool. Figure 2.4 (a). NASA SBIR Example Process Library View Tools. Figure 2.4 (b). NASA SBIR Example View Tool. Figure 2.4 (c). NASA SBIR Example Description. Figure 2.4 (d). NASA SBIR Example Play. Figure 2.4 (e). NASA SBIR Example Documents. Figure 2.4 (f). NASA SBIR Subprocess Guidelines. Figure 2.4 (g). NASA SBIR Example Integration Tool. Figure 2.4 (h). NASA SBIR Example EHB. Figure 2.4 (i). NASA SBIR Example Improvement Tool. Figure 2.4. (j) NASA SBIR Example Requirements Capture Tool (RCT). We discuss here how to update the Summary files in the Demonstration Tool. The summary comes in three versions: HTML, PDF and PPT (Powerpoint). See Figures 2.6 (a) - (d). The summary is used as a quick demonstration. 1. Edit Screen Capture Snaphots of the Summary HTML Files . Edit the local screen capture snapshots of the summary HTML files so that the images reflect those of your examples. Browse the local snapshots in a web browser. 2. Edit Local Summary HTML Files. Edit the local summary HTML files so that the images reflect those of your examples. Browse the local summary files in a web browser. 3. Edit Local Summary Powerpoint Files . Edit the local summary powerpoint file so that the images reflect those of your examples. 4. Edit Local Summary PDF Files . Create fromt the local summary powerpoint file a local PDF file so that the images reflect those of your examples. 5. Copy Local Summary Files To Server . Copy all of the local summary (html, ppt, and pdf) to the summary files on the server. Browse the server summary files in a web browser. 1. Follow the above steps to build the Summary in the NASA SBIR Demonstration Tool. 2. Follow the above steps to build the Summary in your organizations's Demonstration Tool. Figure 2.6 (a). Summary Tool - HTML Index. Figure 2.6 (b). Summary Tool- HTML Page. Figure 2.6 (c). Summary Tool- PPT version. Figure 2.6 (d). Summary Tool- PDF version. Problem. Complete the NASA SBIR Demonstration Tool..
1. Edit Local What are EHBs? File. Make sure that the links in the What are EHBs? index.html page are pointing so that the links point to the examples developed in the problem in Section 2.7. As the development matures (Chapter 3, 5, 6 and 6) toward implementation and utilization, these links can be replaced by links to actaul implemented tools. Browse the local What are EHBs? file in a web browser. 1. Follow the above steps to complete the NASA SBIR Demonstration Tool. 2. Follow the above steps to complete your organizations's Demonstration Tool. We show here how to demonstrate your Demonstration Tool. to potential customers and users and revise it following feedback. Problem. Demonstrate and revise the NASA SBIR Demonstration Tool..
1. Demonstrate Demonstration Tool to Audiences. Present your NASA SBIR Demonstration Tool an audience. Even after the potential customer signs up, one can use the Demonstration Tool as a means of introducing the concepts. 2. Record Suggestions . Record any comments and suggestions for your demonstration. 3. Edit Local Demonstration Tool Files . Edit the local NASA SBIR Demonstration Tool based on comments and suggestions. Browse the local NASA SBIR Demonstration Tool in a web browser. 4. Copy Local Demonstration Tool Files To Server . Copy the local NASA SBIR Demonstration Tool to the servero. Browse the server NASA SBIR Demonstration Tool in a web browser. 1. Follow the above steps to demonstrate and revise the NASA SBIR Demonstration Tool. 2. Follow the above steps to demonstrate and revise your organizations's Demonstration Tool. Figure 2.7. Suggestions Tool (ST). We outiine here sample demonstrations. These are found in Appendix A1. See Figure 2.13. Building Electronic Handbooks Inc.- EHBs. Building EHBs Inc. manages processes for the purpose of demonstrating and building EHBs. The product realization subprocesses include: Demonstrating EHBs, Building, Using, and Revising EHBs and Improving EHBs. FEMA's US Fire Administration (USFA) - Grants. Federal Emergency Management Agency (FEMA) US Fire Administration (USFA) programs manages grants for the purpose of supporting Fire departments across the United States. The product realization subprocesses include: Solicitation Development, Proposal Submissions, Review and Selection, Contract Negotiations and Award, Contract Administration and Closeout, and Post-Award Processes. FEMA's Federal Insurance & Mitigation Administration (FIMA) - Grants. Federal Insurance & Mitigation Administration (FIMA), which manages the National Flood Insurance Program and oversees FEMA's mitigation programs across the United States. The product realization subprocesses include: Solicitation Development, Proposal Submissions, Review and Selection, Contract Negotiations and Award, Contract Administration and Closeout, and Post-Award Processes. HHS's Health Services Resources Administration (HRSA) - Grants. The Department of Health and Human Service;s (HHS's) Health Services Resources Administration (HRSA) programs manage grants for the purpose of supporting health related programs and efforts across the United States. The product realization subprocesses include: Solicitation Development, Application Submissions, Review and Selection, Negotiations and Award, Award Administration and Closeout, and Post-Award Processes. DOJ's Bulletproof Vests Partnership Program (BVP) - Grants. The Department of Justice's Bulletproof Vests Partnership Program (BVP) program manage grants to law enforcement organizations across the United States to obtain Bulletproof Vests. The product realization subprocesses include: Solicitation Development, Application Submissions, Review and Selection, Negotiations and Award, Award Administration and Closeout, and Post-Award Processes. DOJ's Southwest Border Patrol Initiative (SWBPI) - Grants. The Department of Justice's Southwest Border Patrol Initiative (SWBPI) program manage grants for the purpose of supporting border patrol programs and efforts across the United States. The product realization subprocesses include: Solicitation Development, Application Submissions, Review and Selection, Negotiations and Award, Award Administration and Closeout, and Post-Award Processes. DOJ's Local Law Enforcement Block Grants (LLEBG) - Grants. The Department of Justice's Local Law Enforcement Block Grants (LLEBG) programs manage block grants for law enforcement organizations across the United States. The product realization subprocesses include: Solicitation Development, Application Submissions, Review and Selection, Negotiations and Award, Award Administration and Closeout, and Post-Award Processes. DOJ's Office of Justice Programs (OJP)- Grants. The Department of Justice's Office of Justice Programs (OJP) Grants programs manage grants for the purpose of supporting law enforcement organizations across the United States. The product realization subprocesses include: Solicitation Development, Proposal Submissions, Review and Selection, Negotiations and Award, Award Administration and Closeout, and Post-Award Processes. Treasury's Community Development Financial Institutions (CDFI). The Treasury Department's Community Development Financial Institutions (CDFI) programs manage agreements for the purpose of supporting Community Development Financial Institutions and programs and efforts across the United States. The product realization subprocesses include: Solicitation Development, Application Submissions, Review and Selection, Negotiations and Agreement, Agreement Administration and Closeout, and Post-Agreement Processes. NASA's Grants - Grants. The National Aeronautics and Space Administration's Grants programs manage grants for the purpose of developing research that NASA missions could use. The product realization subprocesses include: Solicitation Development, Proposal Submissions, Review and Selection, Negotiations and Award, Award Administration and Closeout, and Post-Award Processes. HHS's Centers for Disease Control and Prevention (CDC) - Grants. The Department of Health and Human Service's (HHS's) Centers for Disease Control and Prevention (CDC) programs manage grants for the purpose of supporting disease related programs and efforts across the United States. The product realization subprocesses include: Solicitation Development, Application Submissions, Review and Selection, Negotiations and Award, Award Administration and Closeout, and Post-Award Processes. Pfizer Pharmacuticals - Research & Development. The Pfizer Pharmacuticals programs manage research & development for the purpose of supporting Pharmacuticals related programs and efforts across the World. The product realization subprocesses include: Solicitation Development, Application Submissions, Review and Selection, Negotiations and Award, Award Administration and Closeout, and Post-Award Processes. How Can I Apply EHBs To My Organization's Processes? link on the EHBs home page http://ehbs.org/.